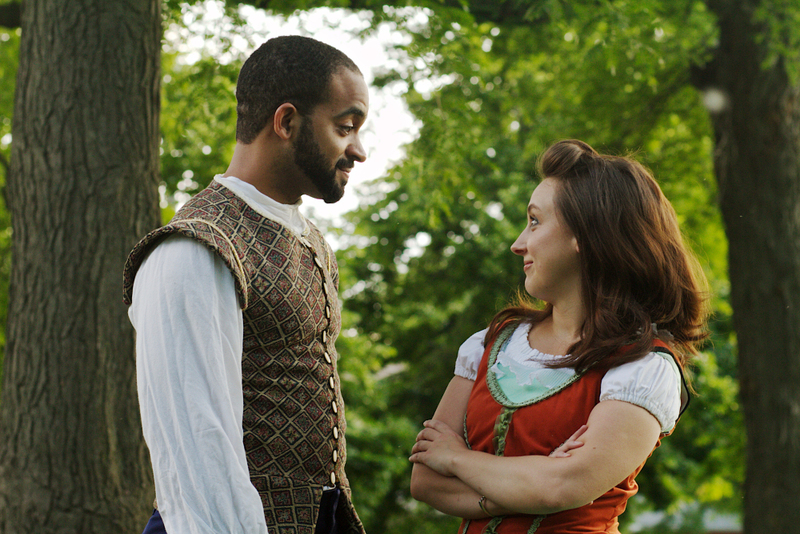 Midsommer Flight announces its third summer season of Shakespeare in the Park with Much Ado About Nothing. Well, this is much ado about something. The show is a tightly-packed comedy. Director Beth Wolf has actors entering and exiting the makeshift stage by running. The action clips. The barbs fly. The love grows. It’s time to fall in love with Shakespeare’s favorite unlikely couple. Vivian Knouse (Hero) and Adam Habben (Claudio) set up the improbable love fest. As Manning eavesdrops, Habben, Chris Smith (Don Pedro) and Scott Olson (Leonato) conjure up a Beatrice love confession. As they perfectly overact, Manning dives in and out of hidden spots in his zest to learn more. He becomes bewitched in their love potion. Over in the ladies zone, Knouse and Kanome Jones (Ursula) deceive Edgemon with words of Benedick’s devotion. At one point, Edgemon, whose comic delivery is aided by her very animated face, is trying to hide between two flower vases. The riotous moment is very ‘Lucy-you-have-some-splaining-to-do‘ slapstick. The set-up for new romance goes off with a hitch. Complications arise when the original happy couple hit a snafu. Habben accuses Knouse of being unfaithful. And here’s why Shakespeare’s stories have resonated over hundreds of years, there is drama mixed in to the comedy, authority is corrupt and no love story is easy. Much Ado About Nothing in the park is an ideal summer outing notion. The night of our performance, gatherers spread blankets with nibbles and libations. There were groups of merrymakers. And couples enjoying a unique date spot. Families were present. And I witnessed at least one kid, maybe 8ish, completely enthralled. There were other kids not paying attention. And worse than a cell phone going off in a theatre is a child’s non-stop chatter. Shakes prose demands attention to enjoy the subtle humor and intrigue. NOTE TO PARENTS: Please do expose your children to Shakespeare. If they are restless, have quiet things for them to do or make an early departure. Do not allow them to compete with the script with their own oration. People came to hear the actors not your children. To be fair, there are also other unnatural noises in a city park; airplanes, ambulance sirens, distant rebel rousing. The actors handled the disturbances with posh. During our performance with all the timing of a planned joke, a biker rode up on the sidewalk as Manning kissed Edgemon. He yelled, ‘give her one for me.‘ Manning responded with a thumbs up and the wannabe extra pedaled away. Ah, live theatre! More more information and reviews on Chicago theatre, visit Theatre in Chicago.